Click a link below to go to each library's amazon wish list. Your purchases will help patrons in prisons and state hospitals enjoy the holiday season. With spirit and fortitude, ILS branch staff enhances the quality of life for unique populations by providing a welcoming, neutral and secure place where informational, educational, and recreational needs are met. 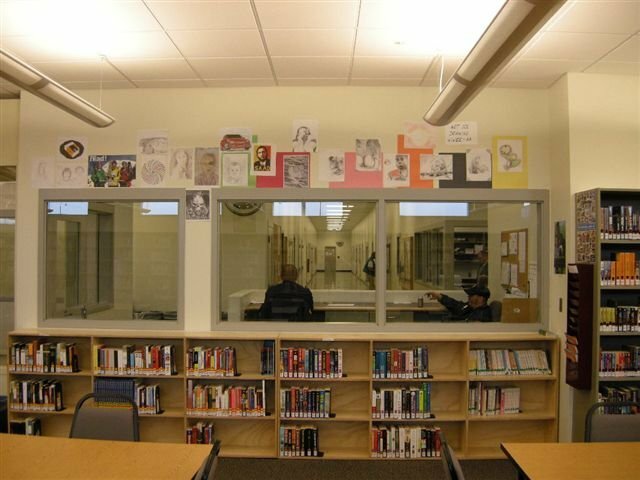 The Washington State Library (WSL) partners with the Department of Corrections (DOC) and the Department of Social and Health Services (DSHS) to provide library services to inmates in adult correctional facilities and patients in adult psychiatric hospitals. There are WSL branch libraries in two DSHS facilities: Western State Hospital and Eastern State Hospital. There are nine WSL branch libraries in DOC facilities: Airway Heights Corrections Center, Clallam Bay Corrections Center, Coyote Ridge Corrections Center, Stafford Creek Corrections Center, Twin Rivers Corrections Center, Washington Corrections Center, Washington Corrections Center for Women, Washington State Penitentiary, and Washington State Reformatory. In addition, interlibrary loan services are provided to the DOC minimum security facilites across the state. Eastern State Hospital for the Insane was established in 1891 in Medical Lake Washington. The branch library currently serves a patient population of 287 with 130 patients registered users of the library. The library houses 7400 items in the library including DVDs, books, magazines and newspaper subscriptions. The Western State Hospital Staff and Patients Libraries opened in 1950, and became part of the Washington State Library's Institutional Services Libraries (ILS) in the early 1970s. The WSH Staff Library soon gained a national reputation for its research collection that focused on all aspects of psychiatry, psychology, nursing, social work and related occupations. The WSH Patients Library offered ward Outreach service, poetry readings, library page training, and other programs that involved active participation by patrons. The Staff Library closed in 2002, due to budget cuts. Today the WSH Library continues ward Outreach and serves patients (760) and staff (1000+) with a collection that emphasizes recovery and advocacy. The library currently houses 7500 print and 4000+ movie and music titles. Airway Heights Corrections Center opened its doors in 1992 on a 160 acre parcel 10 miles west of Spokane. Today its library provides services to the 1600 inmates with 21,013 items in its collection. As one of the larger libraries in the institutions it stays busy with 55 inmates at any given time. The small town of Clallam Bay has been known for its fishing and outdoor sports in the summer months, but in 1985 Clallam Bay Corrections Center opened its doors to house 900 inmates. It now has the distinction of being the most remote prison within the Washington State Department of Corrections. Of those 900 inmates the library serves 732. The library houses 14,240 items with CDS being the most popular checkout. The newest corrections center in the state is Coyote Ridge Corrections Center, which opened its doors in 2008. The library also has the distinction of being the largest in the system and provides educational, recreational, informational and LEGAL materials to its 2,098 inmates. Open 6 days a week for inmates in groups of 32 for legal services and 64 for general library, for a grand total to 96 inmates in the library at any given time. Their collection of 14,000 items is used by inmates at CRCC, as well as loaned to other libraries through Interlibrary loan. In 2000 Stafford Creek Corrections Center opened its doors to almost 2000 inmates. One of the larger facilities, this library houses over 18,000 items to provide for the educational, informational, and recreational needs of inmates. All the libraries provide support to the programs that are offered at each facility, but one particular program brings great joy to the library staff at SCCC Library. The dog program has had wonderful support from the library staff and its patrons. Along with material about training and caring for the dogs, the dogs come to visit and lift everyone’s spirits. The Twin Rivers Unit of the Monroe Correctional Complex has been providing service to its patrons since 1984. With a collection of 14,338 book, CDs, cassette tapes, talking book, and magazines the population of 812 inmates can find most of the items that they need. Anything that goes above and beyond the collection can be requested through the Interlibrary Loan process. Washington Corrections Center is unique in the state of Washington, as it is the receiving center for all male inmates in the State of Washington. With over 2,000 inmates transitioning into the institution on any given day, the library serves around 600 inmates who are long term residents in the Traning Center and Intensive Management Unit. The library has a collection of 14,927 books, magazines, CDs, and music cassettes. The library opened its doors to the women of the Washington Corrections Center for Women in 1971 and still goes strong today. The library currently serves 856 inmates with 15,000 items in its collection. As this prison has the unique duty of housing women, the educational, informational, and recreational needs are slightly different from the male prisons. These needs are met by a dedicated and trained staff member who is able to provide a welcoming environment for the women at WCCW. The Washington State Penitentiary has a rich history starting with its construction in 1886. Using stone brought from the Columbia River the walls around the prison enclosed its first inmates in 1878. Those walls still stand today even though the prison has expanded over the years. Behind these walls a library served its population faithfully until it was closed in November 2011. Today most of the prison is outside these walls, enclosed by fences covered in razor wire. The newest portion is called the West Complex and was completed in 2007. Here a library serves the 1,362 inmates with its collection of 12,109 items. Through the collection, Interlibrary loan service, and a trained staff member, the information and recreational needs of the inmates are met. The Washington State Reformatory, in Monroe Washington, was built in 1910 by inmates and has long history with the Department of Corrections. The library contains a wide vareity of materials, 17,000 items and serves more then 600 inmates. Patrons use the library to find reading and listening material, study for classes, find information for re-entry, and to socialize. A Beautiful Mind. Universal Studios, ©2002. Nobel Prize winner John Nash was a brilliant mathematician who spent years overwhelmed by his schizophrenic delusions. Canvas. Universal, ©2008. Outstanding portrayal of the challenges faced by a man and his young son when their wife/mother is hospitalized. Elling. First Look Home, ©2002. Two young men leave their state-funded institution and share an apartment in Oslo Norway that leads to touching and hilarious results. Frances. Starz Home Entertainment, ©2002. Frances Farmer was a beautiful—and doomed—actress who became trapped in the 1940s American mental health system. It’s Kind of a Funny Story. Universal, ©2011. Based on the semi-autobiographical novel about a teenager who admits himself into a mental health clinic as a means of keeping himself from committing suicide. He finds much to learn and live for. Nobody’s Child. Koch, ©2005. Based on the autobiography of Marie Balter who spent most of her life institutionalized. With love and hope, she created a life for herself most would have considered impossible. Promise . Hallmark, ©1987. A modern classic about the love and tension between two brothers who only have each other in middle age. One is a lonely and driven business man, the other is his schizophrenic brother who has been released from the state hospital. Shine. New Line Video, ©1997. Australian pianist David Helfgott suffered a nervous breakdown at the zenith of his career. With the support of friends, he returned to the concert hall. The Madness of King George. MGM, ©2001. When Great Britain’s King George III showed signs of mental illness, a fierce battle began for political control during war with America. The Snake Pit. 20th Century/Fox, ©2004. This classic was one of the first Hollywood films to portray a mentally ill woman in a compassionate manner. The Soloist. Paramount, ©2009. Journalist Steve Lopez was looking for a simple story when he became involved with a homeless L.A. man who had once been a promising musician. The Shawshank Redemption. Columbia TriStar, ©1995. Two convicts turn hope and friendship into an uplifting bond no prison can ever take away. American Me. Universal Studios, ©1992 James Edward Olmos directed and starred in this violent depiction of gang life in a Los Angeles barrio-- and later--prison life. Murder in the First. Warner, © 1995. This movie depicts the murder trial of Alcatraz inmate Henry Young that finally persuaded officials to close the institution. Back from Madness: the Struggle for Sanity. HBO Productions, ©2003. Film makers followed four patients at Harvard’s Massachusetts Hospital for a year—focusing on both the historic and current challenges for those living with psychiatric diagnosis. Out of the Shadow. Directed by Susan Smiley. Vine Street Productions, ©2004. Intensively personal documentary by Susan Smiley who interviewed her mother over several years as her mother underwent several hospitalizations, setbacks and successes. When Medicine Got It Wrong. KGED, ©2009. In 1974, a group of parents joined forces to hold psychiatry accountable for blaming schizophrenia on poor parenting. That movement sparked the beginning of the consumer advocate movement. Doing Time: life inside the Big House. New Video, ©2006 This documentary looks at life within the walls of the Federal Penitentiary at Lewisburg, Pa., one-time home to Al Capone, Alger Hiss, and Jimmy Hoffa. Examines the daily routines of prisoners, guards, and the warden. Broken umbrellas. By Kate Spohn. Viking, ©1994. A sympathetic portrait of an old homeless woman. Face at the Window. By Regina Hanson. Linda Saport Illustrator. Clarion Books, ©1997. A wise and compassionate mother teaches her child not to fear or hate the “crazy” woman of the village. Sometimes My Mommy Gets Angry. By Bebbe More Cambell. E.B. Lewis, Illustrator. Puffin Books, ©2005. A child is taught by her grandmother how to cope with her mother’s unpredictable mood swings. Visiting Day. By Jacqueline Woodson. Scholastic, ©2002. Gentle illustrations enhance this children's book about a child's prison visit to her father. Frozen Summer. Yearling, ©2000. This novel follows the struggles of a 12 year pioneer girl in 1816 who must face hardships and her mother’s growing insanity. Mary Jane Auch, author. Or Give Me Death. Gulliver Books, ©2003. While Patrick Henry was away advocating for American freedom, his family was faced with the everyday challenge of caring for his psychotic wife during a time that psychiatric care was nonexistent. Ann Rinaldi, author. Rabble Starkey. Houghton-Mifflin, ©1987. A young girl is forced to move in with the neighbors when her mother is suddenly taken away to a mental institution. Lois Lowry, author. The Road to god knows (graphic novel). Allen Studio, ©2007. Semi-autobiographical story of a young Canadian who struggles with the everyday torment of adolescence while witnessing her mother’s mental decline. By Von Allen. Halfway House. Atlantic Monthly Press, ©2006. A family is torn apart by the tensions caused by a child’s self-destructive behavior. Katharine Noel, author. Tomato Girl. Algonquin Books, ©2008. A novel about how mental illness affects every member of the family—as seen through the eyes of a child. By Jane Pupek. Unless. Fourth Estate, © 2003. A mother is frustrated in her attempts to understand and find help for her increasingly mentally disturbed daughter. By Carol Shields. On the yard. By Malcolm Braly. NYRB Classics, ©1967 The author used his experience as an inmate of both juvenile and adult institutions to create a picture of the complex and frightening world of American prison life. Yesterday will make you cry. By Chester Himes. W.W. Norton, ©1999. This novel is based on the experiences of the author. Himes was imprisoned for eight years. Upon his release, he made a modest living free-lance writing. His hard-hitting novel was not accepted for publication for 16 years due to its graphic nature. Today it is considered a classic of the urban literature genre. An Inmate’s Daughter, by Jan Walker. Raven Publishing, © 2006. The compassionate story of Jenna, an inmate's daughter, gives us insight into the challenges of families with a loved one in prison. It reminds all of us that the viewpoint of a child can teach us much about acceptance and tolerance. An Unquiet Mind. Vintage, © 1996. Dr. Kay Redfield Jamison has written a modern classic about the inner life of a woman who gradually comes to accept her psychiatric diagnosis and develop a successful recovery plan. Crazy: a father’s search through American’s mental health madness. Putnam, ©2006. Journalist Pete Earley used all his investigative skills to chronicle the tragedy that befell his mentally ill son and others he came into contact with at various jails, hospitals and halfway houses. He has concluded that America’s mental health system is broken—and needs major reform. Madness: a bipolar life. Houghton-Mifflin, ©2008. Author Marya Hornbacher has written candidly about how substance abuse and undiagnosed bipolar disorder nearly destroyed her and how she rebuilt a new life for herself. Scattershot: my bipolar family. Dutton, ©2008. Most of David Lovelace’s family has been diagnosed with bipolar disorder, also known as manic depression. David treated his wild mood swings with hard living until he finally came to terms with both the disease and his desire to live a meaningful life. The Center Cannot Hold. Hyperion, ©2007. Elyn Saks struggled to keep her diagnosis of paranoid schizophrenia a secret from her parents, friends and colleagues until the disease overwhelmed her. Today, Elyn Saks is a nationally respected expert on psychiatric research and recovery. Wishful Drinking. Simon & Schuster, ©2008. Author, actress and advocate Carrie Fisher talks about her celebrity upbringing and bouts with substance abuse and manic depression. Prison Memoirs of an Anarchist. By Alexander Berkman. NYRB Classics ©1999. After he was convicted and sentenced for attempted murder, Berkman wrote of his coming of age as an inmate in a Pennsylvania prison from 1892-1906. Makes MeWanna Holler: a Young Black Man in America. By Nathan McCall. Vintage Books, ©1995. Washington Post journalist Nathan McCall writes about his misspent youth as a habitual criminal. And he tells about how his job as an inmate library clerk changed his life forever. BP (BiPolar) Magazine Both professionals and patients contribute articles about every aspect of the diagnosis and successful coping strategies. SZ (Schizophrenia ) Magazine Both professionals and patients contribute articles about the diagnosis and successful coping strategies. NAMI Adocate Magazine The National Alliance on Mental Illness welcomes patients, families and individuals that are interested in the political advocacy of mental health care reform. The McNeil Century: The Life and Times of an Island Prison, by Paul W. Keve. Nelson-Hall ©1984 An analysis of the historical events and special operating conditions that made prison life at McNeil Island more safe and humane than at most other penitentiaries. Concrete Mama: Prison Profiles from Walla Walla, by John McCoy University of Missouri Press ©1981 Washington State Penitentiary in the raw reality of prison life. The favorite prison book of all who served time there. Doing Life: Reflections of Men and Women Serving Life Sentences, by Howard Zehr, Good Books ©1996 Bleak b&w photography illustrate Zehr's interviews with 60 men and women serving life sentences in Pennsylvania prisons. Newjack: Guarding Sing Sing, by Ted Conover, Vintage Books © 2000 Investigative reporter Ted Conover spent nearly a year as a prison guard in the notorious New York prison to tell about life inside from the perspective of both the jailed and the jailer. Are Prisons Obsolete?, by Angela Y. Davis, Seven Stories Press © 2003 Former political prisoner Angela Davis makes a well-researched argument for the abolishment of the present-day American penal system. Politics of a Prison Riot: The 1980 New Mexico Prison Riot: Its causes and aftermath by Adolph Saenz, Rhombus Publishing Co. © 1986 Saenz was a witness to one of the most shocking incidents in modern history. He discusses that day and its long-reaching consequences for the American penal system. Bring Change To Mind This non-profit organization was founded by sisters Jessica and Glenn Close as a means to bring public attention to the stigma attached to psychiatric diagnosis and provide a public discussion forum.. Mental Health America This is the organization founded in the 1920s by former psychiatric patient Clifford Beers. Beers autobiography A Mind That Found Itself helped to launch the first organization to champion civil rights for mentally disabled persons. National Alliance on Mental Illness One of the nation’s most influential lobbying groups that was founded by parents who were frustrated by the stigma and lack of support / education about psychiatric disorders. National Empowerment Center Patient founded and supported organization that advocates for mental health reform and a greater voice in new psychiatric care models that include a greater voice from patients themselves. Substance Abuse and Mental Health Services Administration This government-supported website is dedicated to public education about both substance abuse and co-occuring mental disorders. National Institutes of Health This government website is dedicated to all aspects of public health issues and offers information about grants, funding and research. Offers links to other authoritative health information websites. MedlinePlus This government website serves as a portal to various authoritative sites about health and drug issues. Sponsored by the U.S. National Library of Medicine & National Institutes of Health.